We have this very nice two-handled cup. The marks are for London 1769-70 and the maker is John King (Grimwade 1445-6). There is also a photo of a John King mark in Jackson (p. 213) for a tall coffee pot and dated 1769-70. The marks for John King(Grimwade 1445-6), were entered in 1775. 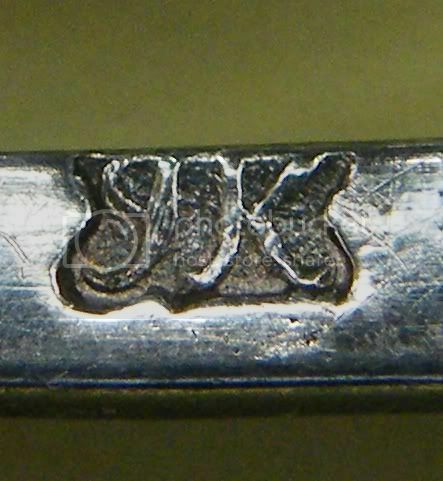 Was it common practice for silversmiths to be using their mark before registration? Grimwade (p.571) does make mention of another John King who was apprenticed to George King. I think there may be a clue in that the John King of Grimwade 1445-6 was free in 1757. I suspect he had entered at least one mark in the 1757 - 1773 period in the largeworkers book for London 1756 -1773 which is one of the lost registers. Any mark entered it it by John King would be lost and not seen by Grimwade . Although Grimwade did record quite a few marks of this period derived from other sources his listing of these marks is not comprehensive. One must always remember that when Grimwade states "First mark 1775 " he means "First mark of which we have a record". In general I believe silversmiths could not have assays done until he had registered at least one mark. However I am certain that once a smith and his journeymen and apprentices were known to Goldsmiths Hall, registration of subsequent marks was not always done before it's first useage. It needed a signature of the master in the register - and so he would probably leave registration until convenient to him. Despite the contemporay claims by Goldsmiths Hall that all marks were always compared with the register, I cannot see this happening in all cases. If the assay office staff were busy, and knew the smith's staff , they would not worry as long as the intials looked right. Thank you so much for the explanation. That makes a lot of sense. I didn't realise that the registers were not complete. There are two missing registers at London, and no registers earlier than 1697. The missing ones are Smallworkers 1739 -1758 and the Largeworkers 1758 - 1773. Celadon , can you provide an image of the IK on your cup please please ? I have a IK mark on an otherwise unmarked buckle of around the same period which I think is English . If your mark matches ...... I can conclude its English and I can probably suggest another name possibility !!! Celadon has very kindly sent us a copy of the marks on this cup. Someone having loaned me a copy of Richard Turners recent book "Collecting Silver, Breaks, Fakes & Assay Marks from whick I now have another suspect for the script IK mark. Turner gives, page 39, Figure 148, an IK mark in block capitals with an undoubted Banff origin. Did this maker (Keith ?) also have a script mark ? If so the absence of a Lion Passant is explained . Has anyone seen this on Banff silver please ? Please !!!!! I believe John King was known for making two handled (loving) cups. I've seen many with this mark attributed to him.